Cheesecake is one of those versatile desserts that can taste amazing with just a few ingredients and be paired up with most sweet things. 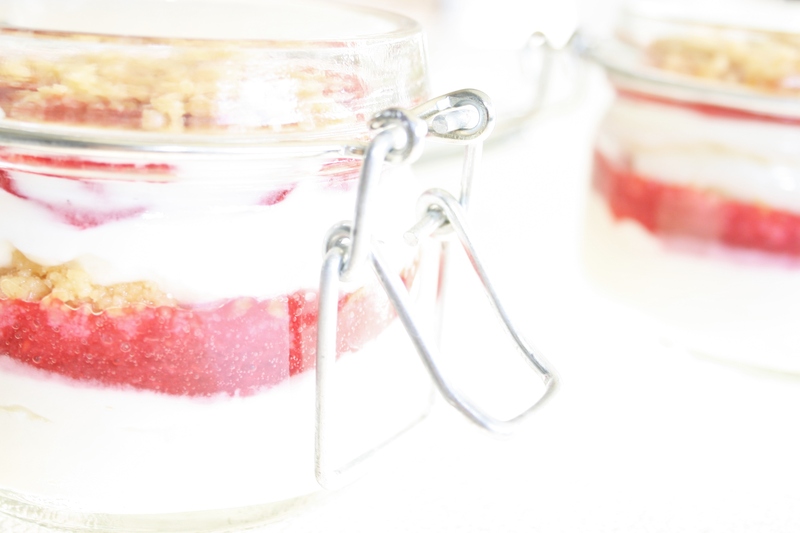 I have worked on a very simple no-bake cheesecake filling with only 4 ingredients, paired it with a basic raspberry coulis and layered with a sprinkling of shortcake crumble. It is seriously delicious with soft, creamy pillows of cheesecake filling perfectly balanced with layers of raspberry and crunchy crumble. And of course super quick and easy to make. I have made mine in small sealable jars, which makes them perfect individual travelling companions to a picnic, outdoorsy event or even a road trip. Simply tie a disposable spoon on top and you are set to enjoy them anywhere. If you are not going anywhere with them, still making them in jars would be a fun way of presenting it at the dinner table at the end of a meal. 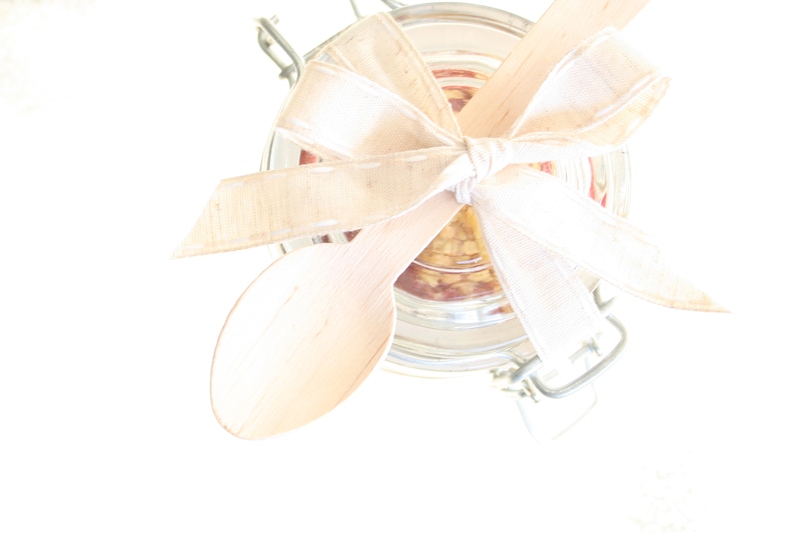 If you don’t have small jars, it will look equally beautiful layered in a martini glass or glass dessert bowl. There is no gelatine in the recipe so the set texture is like a mouse and I wouldn’t recommend using this in a normal cheesecake that you would cut up. And instead of using the biscuit crumbs as a more traditional base, I crumbled it in between the layers. But it will be perfectly fine to use the biscuit crumbs to make a base in individual ramekins (just skip the step of baking the crumbs in the oven, and press into the ramekins straight after stirring in the butter) and then scooping in the cheesecake filling and topping off with the raspberry coulis. The recipe is enough for four 250ml glass jars, which is almost too much per person. Almost. (But I’m pregnant, and seem to have lost my sense of good portion control). So you will get 4 very large portions out of the recipe, or 6 smaller (normal sized) portions. To make the crumble: Pre-heat your oven to 180°C. In a foodprocessor (or by hand) blitz the shortbread biscuits into a fine crumb and stir in melted butter. Spread the crumbs evenly on a baking tray and bake for only about 10 minutes. Remove from the oven and let it cool, it will turn into a delicious crunchy and buttery crumble. To make the raspberry coulis: Place the raspberries and castor sugar in a food processor and puree until smooth (or you could do this by mashing it very finely with a fork if you don’t have a food processor). Strain the puree through a sieve to remove all the seeds and set aside. To make the cheesecake filling: Beat together the cream cheese, vanilla extract and castor sugar until smooth. In a separate bowl, beat the cream until it soft peaks form and fold this into the cream cheese mixture. Mix it until it is smooth with no lumps and scoop into a piping bag (or ziplock bag). To layer the cheesecake: Pipe a layer of cheesecake filling into the bottom of the jar (or glass bowl) and use the back of a spoon to smooth and even the layer. Gently pour a tablespoon of raspberry coulis over the base layer and use the back of a different spoon to evenly spread it across. 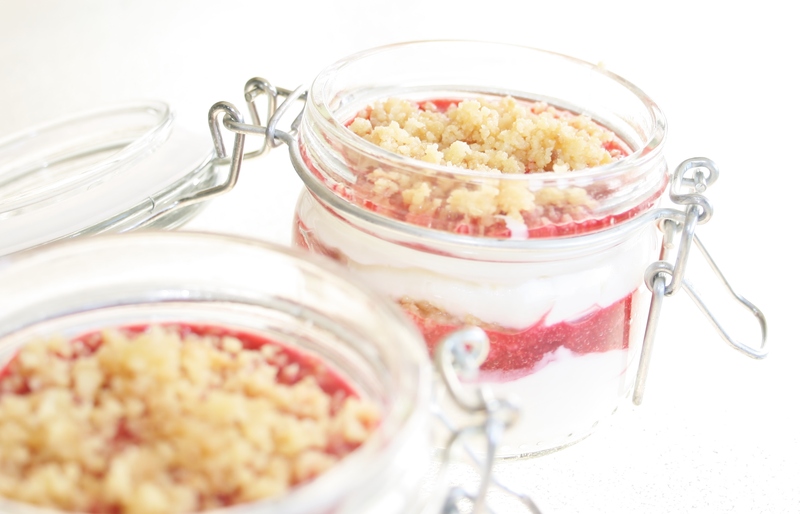 Sprinkle an even layer of the crumble over the raspberry coulis. Repeat with all three layers. Then repeat with remaining glass jars (or glass bowls). Refrigerate for at least an hour for the cheesecake to set.